One reviewer even described it as "life-changing." In a perfect world, it would snow only on the holidays. In reality, there are six more weeks of winter, which means we'll definitely be dealing with more white stuff. My parents, for example, live in Montana where a good pair of snow boots are still fashionable in May. Since they drive so much, I recently encouraged them to invest in a SnoBrum. My boyfriend works at Montana's largest Ford dealership, and SnoBrum is what they use on the lot to clear snow off their huge inventory. Also available at Walmart and Home Depot. With over 1,400 reviews and 4.4 stars on Amazon, it looked like one of those products you want to have on hand — no matter how much you dislike the reason you have to use it. Plus, it had to be better than this Ohio dad's idea of using a toddler. When I asked my dad to describe his new toy, he said, "Easy to use." SnoBrum, which weighs just over 1 pound, comes preassembled and works like a push broom. 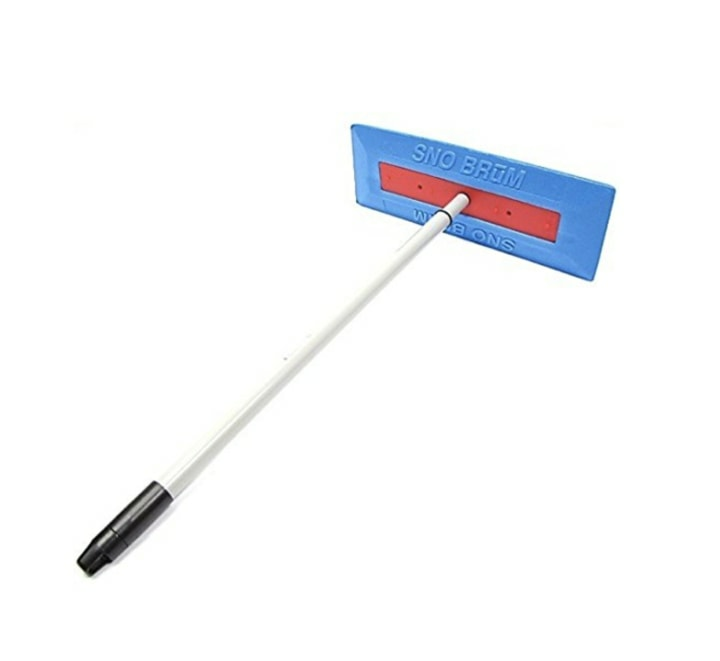 However, unlike most brooms, it has a "cross-linked, high-grade Polyethylene" foam head instead of bristles. It's also telescopic: In my dad's words, it collapses and expands with "just a twist of the handle." My dad is more than 6 feet tall, but since he drives a Ford F-150, he appreciates having the option to extend the handle up to about 4 feet. It's long enough that he doesn't have to walk around to the other side of his truck. In just one swoop, he can reach it all. "It's also light and well-balanced," he told me after cleaning nearly three inches of snow off his truck and my mom's Subaru Forester. "It will even be good for cleaning off deck furniture and other things I don't want to scratch." Years ago, my mom used a metal shovel to remove snow from her Ford Bronco II. Not surprisingly, some of the windshield came off along with the snow. It was an expensive mistake, but one she wouldn't make again. "I could have paid for about a dozen SnoBrums for what it cost me to replace the windshield," she said. Plus, it's made in the U.S. — when I reached out to the Worcester, Massachusetts-based manufacturer who has been making SnoBrum for nearly 25 years, a spokesperson told me all assembling and packaging is done by individuals living with disabilities in the community. My parents have yet to leave a SnoBrum review on Amazon. (Montana probably got dumped on again and they're too busy digging out.) But I have no doubt that it would be at least four stars and my dad would make some kind of joke about how it's saving their marriage. Right now, the top-rated positive review begins with "Life. Changing." The reviewer should know. She lives in Alaska where it's probably fashionable to wear snow boots in June.